BERKEBILE 2+2® MOTOR FLUSH... is specifically designed to completely clean and flush an engines lubrication system of gum, sludge, and varnish that builds up on the inner walls of the oil chamber, valves, and rings, of your engine when changing the oil in your vehicle. CLEANS ENGINE IN 5 MINUTES! 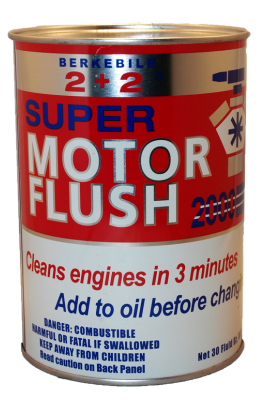 FLUSHES ENTIRE LUBRICATION SYSTEM OF YOUR ENGINE! REMOVES GUM, SLUDGE, VARNISH, AND HELPS FREE STICKING VALVES AND RINGS! Check engine oil and make certain engine oil is up to safe level. Add entire contents of can (30 oz.) to cold engine before changing oil and filter. Idle engine for 5 minutes. Drain engine oil and remove oil filter. Replace drain plug and install new oil filter. Refill engine with motor oil. NOTE: Extremely dirty engines may require a repeat treatment.